The fifth day is highly auspicious day during Navratri and is dedicated to the Skanda Mata form of Goddess Durga. She is worshipped on October 14, 2018 during Navratri. Lalita Panchami Vrat dedicated to Upang Lalita is observed on this day in Western parts of India. The day is also the second day of Navratri Lakshmi Puja. Goddess Skanda Mata represents the motherly aspect Goddess Durga. She is the mother of Skanda (Kartik or Muruga). Durga is also worshipped as Chinnamasta and Upang Lalita on this day. Devotees observe a fasting dedicated to Goddess Lalita aspect of Durga on this day mainly in Maharashtra and Gujarat. The vrat is known as Lalita Panchami Vrat. In some regions books and musical instruments are worshipped and displayed on this day. It is considered as a sort of invocation to Goddess Saraswathi, who will be grandly worshipped in two days time. 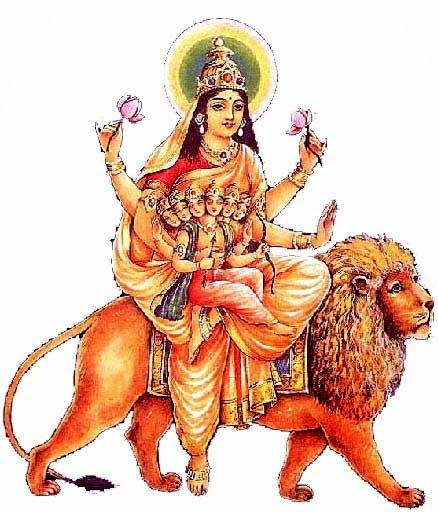 Goddess Skanda Mata is depicted with four arms and she rides a lion. Her one hand is in blessing posture and thus it is the maternal form of Durga. It is believed that Skanda Mata fulfills the wishes of having a healthy and intelligent children. She helps a devotee on the path of Moksha or liberation. It is believed that Skanda Mata see all devotees as her children and protects them. To make the Goddess happy, devotees offer things associated with marriage like red color bangles, sindhoor, nail polish, red flowers, red apple, red bindi etc. All these are offered to Goddess Skanda Mata on the fifth day for welfare of children. It is believed that those wishing have a child will have it fulfilled.